We are a private family owned and operated company since 1932. Our founder, Jacob Moshen, started buying and selling goods in the 1920’s. His tireless approach and guiding hand projected his son Eli Moshen and son-in-law Arden Merback into the business in the 1950’s. Throughout this period and into the 1960’s, Quaker City Auctioneers directed 52 auction sales per year. As the 1970’s approached, this prodigious schedule gradually changed. Eric Merback became the 3rd generation licensed and bonded auctioneer of the company, as well as the AMEA-certified appraiser on staff. Quaker City Auctioneers’ origin into this profession evolved out of our ability to buy and sell equipment, commodities and all types of retail/wholesale goods. In addition, the prevailing trend influenced us to act as agents for the courts, banks, consignors and the demands of the marketplace that have created the foundation and basis of our auction, appraisal and liquidation business. 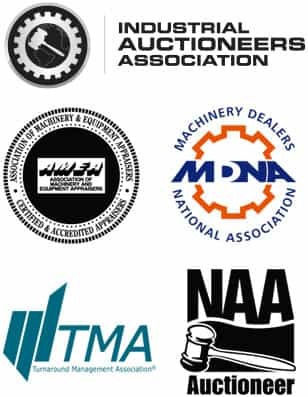 MDNA – Machinery Dealers National Association: An organization comprised of used metalworker and allied machinery (wood, process and packaging) dealers engaged in buying and selling machinery and equipment with a nationwide network of co-operating dealers exchanging information and working together on joint ventures. AMEA – Association of Machinery & Equipment Appraisers: An association of certified and accredited appraisers in the appraisal of machinery and equipment for purposes of liquidation, refinancing, business take-overs and consolidations, estate settlements and civil proceedings. NAA – National Auctioneers Association: An association of auctioneers from all 50 states disseminating information about the industry.